This post is Part 2 in the series on Full, or True Cost Accounting for Foods. All parts use a graphic model to tell a story of causes and effects. This series tries to “connect the dots” to show how the government and Food, Inc. have given us a wonderful benefit: cheaper, faster, and apparently more diverse eating. The cost at the counter when we buy foods, especially in grocery stores, is remarkably inexpensive as a portion of average US income. But this cost at the counter conceals much. A full, or true cost accounting will assess not just immediate cost advantages, but future outlays and long-term costs and benefits as well. Thus, we will look ahead further into the future and try to show how substantial social and economic problems come about as a result of the same forces which brought about the benefit of cheaper, faster food. Design of foods for Craving. You can review Part 1 or just follow the story from the graphic model. The tale is not told if we stop the conversation at the red starburst of benefit. There are two dark clouds of social and economic costs – increased taxes to pay for the subsidies and bureaucracies set up by the government to administer the subsidies, and increased health care costs. The increased health costs trace back to nutritionally impoverished foods (called “fudes” in this account), because they have been designed by the fewer, larger companies and chains in Food Inc., to use cheaper ingredients and have a longer shelf life. This gives bigger profit margins for advertising, packaging, and distribution so these fudes can be presented to us at any time and place, to invite us to eat something that market research has shown we will enjoy and buy again and again. It is hard to fault the companies that make up Food Inc. for finding out what we like, what we will buy again and again. We can’t fault them from bringing these products to our attention by advertising. It makes good business sense, and it is convenient for us, to reward them with profits for making it easy for us to get our hands on the fudes we crave; and do so as quickly and easily as possible. The problem is the extremely high social and economic costs of the wide availability of fudestuffs, when our bodies have developed over millennia to eat foodstuffs, which do not have the hyper-palatability features of fudes. It is that new arrow added to the Part 2 picture above that adds so much to the depth of the problem: Scientific Design to induce CRAVING. This new element, going beyond the part 1 graphic model (at the lower left), has two arrows, connecting cause and effect, coming out of it. One goes to the green “Fudes” can. It adds to the definition of a “fude” that a “fude” not only has a longer grocery shelf life and cheaper ingredients by having taken out perishable ingredients and adding durable packaging; it not only can be made available anywhere, anytime, and be advertised widely: It also has been designed to be as palatable as possible – even hyper-palatable”. Herein lies a deep problem. An earlier blog introduced (or re-emphasized to our readers who were aware of them) two important books dealing with an understanding of what has caused the overeating epidemic. Both books implicate food addictions in the overeating epidemic. They both use the term “addiction” when talking about the brain circuits that connect the taste, smell and sight of fudes with the reward center in the brain. The same type of brain activity is associated with addictions to harmful drugs. Drugs induce being pre-occupied with the thought of the needed substance to the point of strong craving, seeking after it, and taking it in excess into the body. This craving response is explained well by both authors. Former FDA head David Kessler links the craving strongly to food hedonics research in his book, The End of Overeating: Taking Control of the Insatiable American Appetite . Kessler interviewed experts in food design. He outlines what the hedonic properties of food are, and links it to skillfully designed layers of fat, sugar, salt, and then to textures and added taste highlights. Kessler uses the term hyperpalatability to describe the result of designing foods (or more properly, fudes) that will greatly appeal to the reward center of the brain. But he does not hesitate to use the word “addiction” when describing the effects on the brain. He shows that hyperpalatable, or hedonically designed fudes get right to the reward center deep within the brain. Taste and smell have express pathways to the reward center, and even just seeing a previously rewarding food is enough, when we are sufficiently hooked, to highjack our brain. The second book, by medical doctor and researcher Neal Bernard is Breaking the Food Seduction: The Hidden Reasons Behind Food Cravings---And 7 Steps to End Them Naturally . Bernard does not hesitate to use the word “addiction,” although “food seduction” and “craving” are key terms in his work. 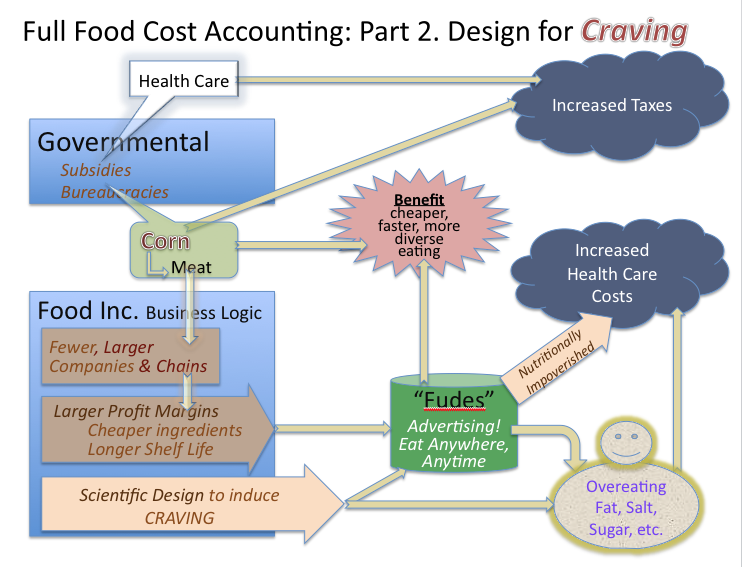 Kessler spends more time unraveling the causes, and his work is key to the part of our graphic model that highlights sugar, fat, and salt in overeating, leading to increased health care costs. I strongly invite you to devote less than four minutes to watch a little movie where Kessler comments about the challenges raised by his book. You will learn a bit about how the food industry has hijacked our brains, and will understand that it is not just those who are overweight, but all of us are to some degree ensnared. We struggle daily against food obsessions while we do not understand where these cravings come from and why we find them so difficult. In Part 1 the role of environmental factors related to overeating fudes was discussed. One of the best sources we have found to document the role of everywhere, anytime availability is Food Psychologist and researcher Brian Wansink’s book Mindless Eating: Why We Eat More Than We Think . Wansink’s research shows how the easy access to foods in our environment – and increased serving sizes is connected to overeating. The Kessler and Bernard books (and new research, below) trace the connection to the reward center in our brains brain that increases craving. This connection to the high-powered reward center is what overcomes getting full and not overeating. The connection to these brain mechanisms explains why we feel obsessive about certain foods, and overeat – far more than we need. The increased interest of excellent researchers, whether with medical, psychological, neuroscience, or other credentials signals an escalation of the challenges to Food Inc. by independent scientists and investigative journalists. Dr. Grandma shared with us in a recent blog some of the reaction of representatives from the High Fructose Corn Syrup industry to a recent Princeton University study. It implicated HFCS with fat build up in the organs and with reduced insulin sensitivity, the core problem in type II diabetes. Dr. Kessler is no stranger to these types of battles with an industry whose profits are threatened. He fought for years against big tobacco, and with considerable success. Just today (written 10 April 2010) Nutrition-Action Newsletter republished a crucial study originally published online March 28, 2010, in Nature Neuroscience. As a lead-in to this article, an interesting observation is that only human beings and their domesticated animals are subject to obsessive overeating, even to the point of obesity. Wild animals stop eating when they are full. Rats are not always thought of as domesticated animals, but the rats in these studies grew up in cages in labs. These rats were given the choice of regular, nutritious rat chow or junk food – Ding-Dongs, cheesecake; also bacon, sausage and other things we eat – but know we should not eat in excess. One group of rats only had access to the junk fudes one hour per day, while the others had access at any time they chose. This group soon began to go after the junk fudes all day, and stopped eating their regular healthy chow. They overate to obesity. Not only that, but previously, they had been conditioned that right after a bell sounded, they would receive a shock unless they got out of the way. The obese rats would not leave their munching on the junk food even to avoid the shock! It was found that their brains had a decreased level of dopamine compared to the rats in the one-hour-of-junkfood group. Humans who are addicted to drugs also turn away from healthy things, obsess over getting the drugs and staying on them, and have lowered levels of dopamine in their brains. The authors of this article conclude that overeating of palatable high-fat food triggers addiction-like responses in the brain reward systems and leads directly to compulsive eating. If you watched the 4-minute Kessler video by clicking the link above, you will have noticed the term “high-jacking our brains” to refer to the effects of these carefully designed fudes. This study provides very clear evidence that the effect on the rats is compulsive behavior like that found in drug addictions. Moreover, there are changes in the brain that also resemble drug addictions. The rats put themselves in a position to have their brains highjacked. The coming counterattack from the Food Industry on studies like this is predictable. “This study used rats, not humans”. “It was biased”. “It doesn’t prove that what the rats ate caused their compulsive behavior”. Actually, the study design pretty strongly does show this. In group ‘one’ the rats were restrained, and could only eat the junk food in moderation. The rats that became compulsive overeaters were not forced to eat only the junk food. They had a choice. They became compulsive, as human drug addicts do. They wouldn’t even stop to avoid a shock. This is the second part in the story of true accounting for the costs of the benefit of foods and fudes -- a reduced cost at the checkout counter. Our bodies were not designed to deal with hyperpalatable foods that do not naturally occur in nature. Hyperpalatable fudes can hijack the connections to the reward center deep within our brains. This leads to craving that leads us obsessively to seek out and eat these fudes in excess – far more that we should. Books have been cited with good suggestions for breaking out of these patterns. It is indeed easier than overcoming drug addictions. The Mediterranean style of eating, discussed within this website, is our recommendation . In the next Part of this story of Full Cost Accounting, I will introduce some other dark clouds that offset even further the starburst of benefit that the government and Food Inc. have together given to us. One has to do with reducing the cost of food and fude production even further by driving out quality employment and worker income all along the food chain, from the farm to the table. In the meantime, try this new Exotic Papaya and Wheat Berries recipe and remember that it is possible to prepare real foods, whole foods, that have high palatability -- yumminess in Dr Grandma's vernacular. Read what Kessler's interviews with experts in food hedonics research reveal, then rejoice with us that it is possible, not too expensive, a lot of fun, and really yummy, to eat foods which are not nutritionally deprived, and which are also designed to be yummy -- just not to the level of these hyper-palatable, seductive fudes our ancestors never encountered. Alarmed over All the Sugar Toxicity Chat?